The dream of ubiquitous computing is becoming a realization with the launch of smart glasses by Google called Google Glass. These are wearable glasses able to recognize your voice commands to perform various operations and it is connected to internet. The glass has a tiny screen attached to a rim above the right eye which is used to display information continuously and is controlled by voice commands. The device runs on Android operating system so it means all the features of Android operating system are available on the device. Since Android supports programmable applications so I think it should support custom applications written by programmers in the future. Currently the glasses are controlled by voice command and support the following amazing features. It displays current time when you say “OK glass”. It takes a picture when you say “take a picture”. It is able to record a video through voice command and you are able to record video with your hands free. You can also share what you see live. Might be Google is offering some video streaming service for this. Details will be revealed later on. It can display driving instructions right in front of you. You can ask whatever is in your mind to the glasses and it will record it in the form of notes. You can also translate your voice different languages. It can locate the well known location you are in and can display automatically useful information related to that location. For example, if you are at airport then it can detect your location and can display flight schedule of that airport. This is very cool feature. So it answers without having to speak. It has very evolutionary design and comes in different colors such as Charcoal, Tangerine, Shale, Cotton and Sky. Google says that it will hold a public contest to distribute a limited of internet connected eyeglasses at the price of $1500. In the contest, the participants will have to write a 50 word application describing how they will use Google glass in a innovative and useful way plus five pictures and a 15-second video. The application should be submitted via Google+ or Twitter. 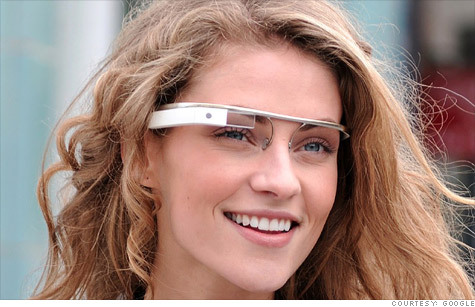 The final production version of google glass will be available in the market at price below $1500. Google ties Apple with 700,000 Android apps INSTALLING HUSBAND….. Terminator Eyes: Hi-tech contact lenses show texts and maps Google ! CIA – Computer Industry Acronyms Google Facts TIL power rangers created the Google chrome symbol Is your website Indexed? Do you need Search Engine Optimization?